Arizona headed to the City by the Bay on Monday to kick off a crucial three-game series. I was fortunate enough to be among the 40,000-plus fans packed into AT&T Park. It was a memorable experience as the D-backs showcased clutch hitting coupled with dominant pitching en route to a 5-2 win over their division foes. The win brought the D-backs to within one game of first place in the NL West. Game two is slated for Tuesday night in what looks to be a spectacular pitching matchup. Daniel Hudson (10-7) will toe the rubber against two-time Cy Young award winner Tim Lincecum (9-8). But before tonight’s game gets started, let’s take a look back at what made last evening’s game a thriller. Since the stadium opened in 2000, I’ve constantly heard rave reviews about the ballpark and its surroundings. Sure enough, it was an unmatched experience (except for a game at Chase Field, of course). AT&T Park, which is located in China Basin, sits comfortably on Willie Mays Plaza and next to McCovey Cove. Before the game, I was able to stroll along the walkway just beyond the outfield bleachers in right-centerfield. On my right was a picturesque view of the San Francisco Bay. While on my left, I watched as Justin Upton and the rest of the D-backs took batting practice. The ballpark provides some of the best sights in all of baseball. With the cove, a booming scoreboard in centerfield, and the well-recognized Coca-Cola bottle and larger-than-life glove in leftfield, there is plenty to see and do at AT&T Park. Kennedy has been as a good as advertised and then some this season. The right-hander continues to pitch like an ace as the season progresses into August. Needless to say, I was pretty excited to see Kennedy square off against San Francisco right-hander Matt Cain. Cain has certainly pitched well throughout 2011, but I’d counter with Kennedy any day. Monday’s start was no different for Kennedy as he held the Giants’ offense to a pair of runs. After allowing a Cody Ross solo home run to lead off the bottom of the first, Kennedy settled in nicely by retiring the side 1-2-3 in both the second and third frames. After both Carlos Beltran and Pablo Sandoval reached base with one out in the bottom of the fourth, Kennedy silenced the AT&T Park crowd by striking out Aubrey Huff and Nate Schierholtz to end the threat. The rambunctious crowd was one its feet once again in the sixth when Beltran laced a two-out triple. Kennedy quieted the Giants’ faithful for the second time by retiring Sandoval on a fly out to left. In the end, the D-backs’ ace tossed eight solid innings, while scattering six hits and striking out seven en route to his 13th win of the year. It was yet another masterful pitching performance by one of the game’s most talented young pitchers, and I was lucky enough to witness it in person. Cain was in cruise control for the first five innings. But the top of the sixth was a whole different story. The red-hot Upton starting things off with a leadoff single to left. Chris Young drew a walk and Miguel Montero drilled an RBI single to right to knot the score at 1-1. The hit parade continued with Ryan Roberts’ RBI single into left field. With two outs, Willie Bloomquist smacked a ground ball up the middle that scooted on into center field, allowing both Roberts and Gerardo Parra to score. As you can imagine, AT&T Park and the thousands of Giants fans were dead silent right about now. 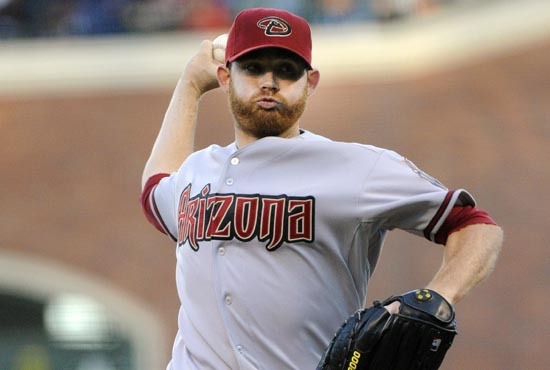 The sixth inning saw the D-backs’ offense explode for five runs on five hits. That half inning proved to be the difference maker. I had the chance to talk with hard-hitting first baseman Paul Goldschmidt during Spring Training and at the XM All-Star Futures Game last month. He’s not only a skilled player, but a quality guy, as well. Prior to the Giants’ series, the D-backs selected him from Double-A Mobile. I was able to witness his highly acclaimed Major League debut in the series opener. Manager Kirk Gibson penciled him into the starting lineup at first base, batting seventh. Goldschmidt wasted little time in making his presence felt by lining an opposite-field single off of Cain in his first at-bat. After hearing the hype surrounding Goldschmidt since the spring, I was thrilled to be on hand for his D-backs debut. Monday’s game marked the first time in which I’ve attended a game as an opposing fan. Of course I donned my 2011 Justin Upton All-Star Game T-shirt and a Sedona red D-backs jacket. Throughout the game, I received plenty of “boos” and some good-natured harassment from Giants fans. I was sternly told to “sit down” when I applauded Kennedy’s outstanding efforts. Fortunately there were several groups of Arizona supporters scattered around my section. The D-backs’ win made it even better as the majority of the Giants fans were pretty quiet on their way out of the stadium. Overall, my first game in San Francisco was a memorable one. It doesn’t get much better than watching the D-backs win in one of baseball’s best ballparks.